The Grickle Grass Festival of London, ON is back for a second year of sustainability in action! Taking place in the dynamic and creative atmosphere of Londons Childrens Museum, the daytime programming will be from 10am to 5pm. On the second floor located at the "On The Street Where You Live" station, I will be offering a yoga workshop that incorporates environmental education. "Sustainable Stretches with Nicole: introduces free flowing movements and energy tapping yoga to kids and parents alike. Enjoy fun and interactive games centred around sustainability and environmental topics such as transportation, waste, food, water and energy. Learn how to reduce YOUR ecological foot print." Eco Veg Footprint will see you there! The Grickle Grass Festival is an innovative, sustainable living festival and fundraiser for Growing Chefs Ontario and The London Regional Children’s Museum. The event takes place at The Children’s Museum and offers both daytime and evening programming.From 10am to 5pm children and their caretakers will be able to take part in a variety of special workshops and activities. There will be bike workshops, magic, drama and yoga. Live entertainment will include Marty Kolls and her Kids’ Dance Party and Traditional Inuit throat singing with Jessica Athlueetuk. Kids will also be able to take part in the planting of the Museum’s Grickle Grass Vegetable Garden. We have a plethora of artists whose sweet sounds will be filling every nook and cranny of The Children’s Museum. Elfin Saddle is joining us from Montreal bringing their brand of acoustic folk and also will be screening their film WURLD charting the entire rise and fall of a civilization.From Toronto we welcome D-Sisive. Indie hip-hop artist, D-Sisive is taking break a from his tour with Shad to join us at The Grickle Grass Festival. Polydactyl Hearts hails from Guelph and are and eight piece multimedia collective that are known for their talents of intersecting sight and sound. The evening will include an array of local talent, including Olenka, of Olenka and The Autumn Lovers. Olenka mingles a strong Eastern European influence with element of North American country and folk music to create unforgettable melodies. 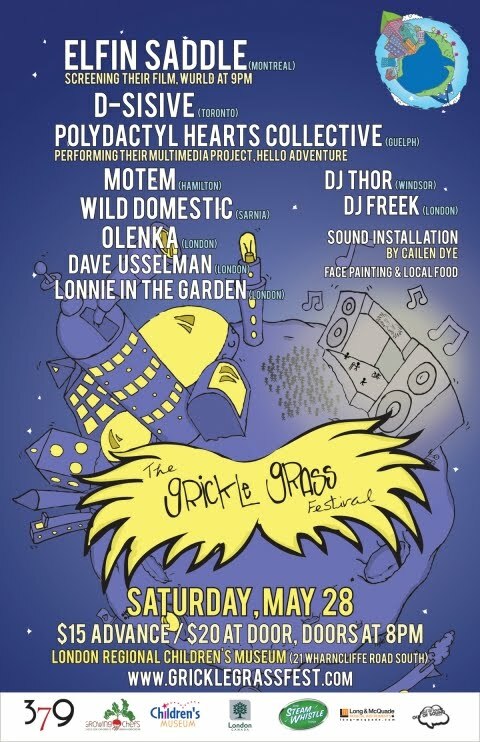 The Grickle Grass Festival will also play host to: DJThor (Windsor), Motem (Guelph), Wild Domestic (LND), Lonnie in the Garden (LND), Dave Ussleman (LND). 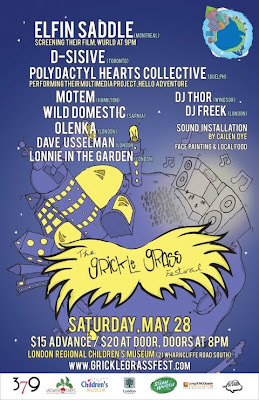 The Grickle Grass Festival: Saturday May 28, 2011Day: 10am to 5pm – regular museum admissionEvening: 8pm to 1am – tickets $15 in advance and $20 at the door. Evening is a 19+ concert.